Visit us at CQMS’17 ! 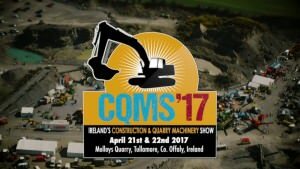 Machinery Movers Magazine is hosting Ireland’s largest construction and quarrying machinery show (CQMS) at Malloys Quarry Tinnycross, Tullamore, County Offaly on April 21st and 22nd 2017. The show will offer buyers and sellers an opportunity to see live demonstrations with latest machinery from manufacturers and a unique opportunity for international buyers to do factory visits. The Anaconda range of equipment will be presented by RK6 ‘Red Knight 6 Limited’. RK6 will be on stand 6 in zone 4 (blue zone). Paul Donnelly of RK6 is pleased to announce that they will be displaying an Anaconda screener on the stand. We look forward to seeing you there .